Cheeseboards – the staple of the festive period. Perfect after a long day or Christmas shopping, a fantastic light lunch for all your guests, and a delicious way to round off your Christmas meal. This Christmas why not put a modern twist on your traditional cheese board and serve Yorkshire Wensleydale with Caramelised Orange & Masons Yorkshire Gin Cheese – mouth-wateringly unusual and incredibly tasty! Treat yourself and surprise your guests this festive season with this new indulgent flavour. Whether you serve your cheeseboard humble or grandiose, here are our top tips for the perfect Christmas cheeseboard, guaranteed to hit the spot. 1. Always store your cheese wrapped, in an airtight container in the fridge, away from other strong-smelling foods. This will ensure that your cheese keeps its true flavour and prevent it from drying out. 2. Remove your cheese from the fridge an hour before serving, so that you can enjoy the full flavour and texture of the cheese. 3. Allow approximately 80g of cheese per person for your cheeseboard; we recommend 4-5 varieties. Think about a selection of cheese varieties that will give you a contrast of flavours, textures and colour on your cheeseboard. Our classic cheeseboard collection would include a selection from the following…. • A ‘crumblier’ variety; Yorkshire Wensleydale has to be the winning choice here! • A Blue cheese – Wensleydale Blue has broad appeal for newcomers to blue cheese and connoisseurs alike! Our Blue 16 adds strength of colour & flavour as an alternative. 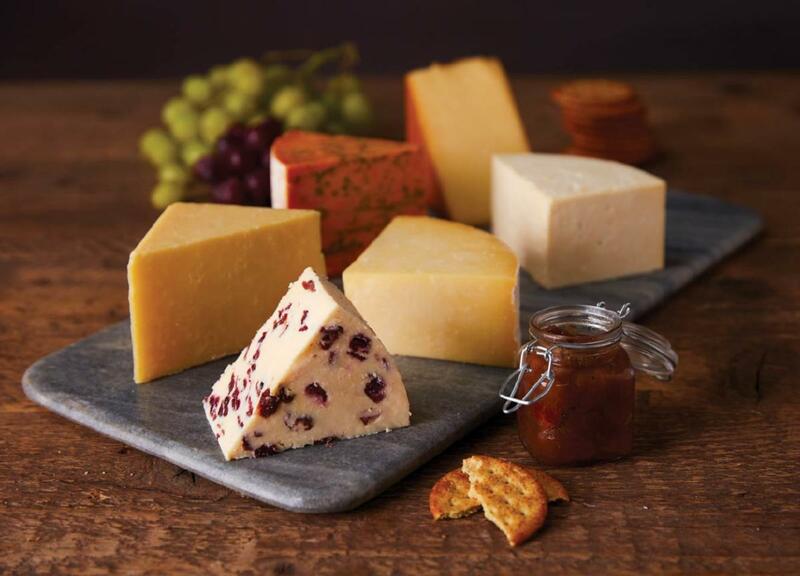 • Not forgetting a sweet, fruity variety – Yorkshire Wensleydale & Cranberries an eye-catching firm favourite, and a cheese which adds fantastic colour too! 4. Choose a selection of crackers to serve – different types of cheese will match better to different varieties of crackers, and this will also add visual appeal. 5. Serve your cheese with a selection of accompaniments – choose from grapes, chutney, quince, freshly cut apple or pear, celery, nuts, figs, dried fruit, or cured meats; keeping it local you could try chorizo and salami from the Yorkshire based award-winning Three Little Pig range, which are a popular choice at our Visitor Centre. 6.Consider which accompanying chutney will make your cheeseboard standout; different types work well with certain cheeses. For example, a naturally sweet chutney made from apple, sultanas and traditional spices, pairs well with Yorkshire Wensleydale cheese. Whereas a richer, full-bodied chutney such as Fig or Red Onion Marmalade is superb with Wensleydale Blue and Kit Calvert Old-style Wensleydale. 7. You may also wish to include some fresh crusty bread, and some good quality butter. Our salted Yorkshire butter has great flavour and compliments the cheese well. 8. Above all – take the time to enjoy your cheese! And if you aren’t sure which cheeses to choose, why not order one of our cut cheese boxes? The selected cheeses are freshly cut and wrapped just for you by our Cheese Shop team at The Wensleydale Creamery Visitor Centre, and delivered direct to your door. So, all you need to do is relax and choose what to enjoy them with!